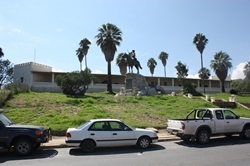 from/to Windhoek covering the most prominent spots all over Namibia on a self-catering or camping basis in order to reduce costs. The Shoestring tour was named this way since it is a trip especially valid for students and young people but can at any time be upgraded for any other traveller who appreciates the route. During this safari Windhoek, the Kalahari, the Fish River Canyon, an ancient castle in the desert, Sossusvlei, Swakopmund as well as Etosha National Park are on the menu so it includes the best of everything. Leaving Windhoek after a delicious breakfast handmade or catered for in one of the many cafes your road takes you south into the outskirts of the Kalahari Desert. Today might be the first morning to get in contact with the Namibian alarm clock which will wake you even before sunrise. Leaving the canyon your road starts climbing northwards again unless you have decided to add a couple of days at the first European settlement in Namibia, Luderitz. If not your route leads you via Seeheim and Helmeringhausen towards Maltahöhe where you will spend the night with a relic of the past right in front of your window. Prepare a sumptuous meal over the fire or join your hosts for a farm style dinner. 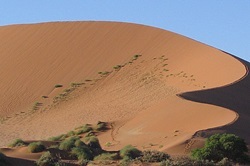 The next highlight is on the menu leading you to one of the most well known sightseeing spots of Namibia, Sossusvlei. 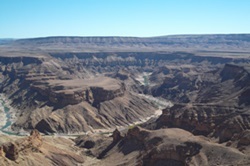 Just outside the gates of the Namib Naukluft Park, that hosts Dead Vlei and Sossusvlei as well as Sesriem Canyon, you spend two nights marvelling on breath taking vistas over wide stretched desert plains. If you are still energetic on the day of arrival climb down into the Sesriem Canyon enjoying the coolness near the water pools that stay filled during most of the year. On the morning of day two it is rising early, before sunrise, so that you can enter the park when the gates open to experience the colour play on the dunes as the sun rises. 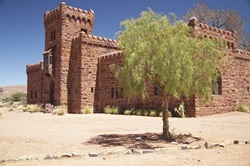 If doing Hotair ballooning has always been a dream for you, this is the perfect surrounding to make your dream come true. 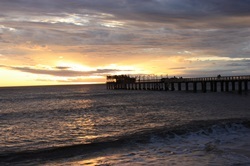 Via Solitaire, the scenic Ghaub and Kuiseb pass, as well as the harbour-town of Walvis Bay you reach Namibia’s premier coastal holiday resort, the small history laden town of Swakopmund. 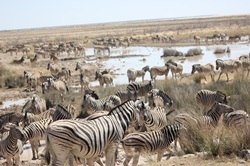 Travelling through the northern centre of Namibia with its photogenic landscapes, you reach the famous Etosha National Park your last highlight of this tour. Enjoy the splendid surroundings of your lodge, with a perfectly relaxed atmosphere should you want to enjoy dinner in the restaurant and breath this real African feeling being produced by locals singing and dancing in the corse of the evening. 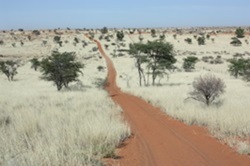 Driving back to Windhoek on good tar roads you still have some time to bid your farewell to Namibia for this time. 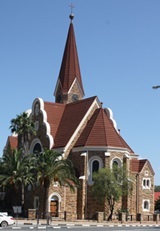 Travel via Outjo, Otjiwarongo and Okahandja, not missing the woodcarvers market in Okahandja for some last minute souvenir and gift shopping. Well in time for your afternoon flight return to the International airport, return your rental vehicle and check-in for your outbound flight.